A 2½ mile linear or 3 mile circular walk around Kensington Gardens from Lancaster Gate tube station to Queensway (linear). There is a cafe, restaurant (the Orangery) and seasonal kiosks within the park and plenty of places for refreshments along Queensway. The State Apartments in Kensington Palace are open to the public [website]. The Serpentine Gallery mounts a programme of free exhibitions. From the station cross and go left along Bayswater Road. Just before the Victoria Gate you can view through the railings a pet cemetery. Enter by Victoria Gate (actually in Hyde Park) and go to the right. The attractive Buckhill Lodge was built in 1852 and altered in 1888. Continue to Queen Anne's Alcove. This building of 1705 by Christopher Wren was originally located to the south of Kensington Palace. 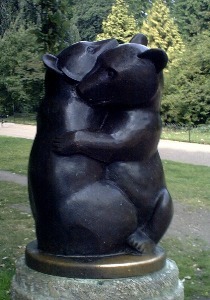 Just ahead the Two Bears drinking fountain at the junction of paths was recast in 1970, the 1939 original having been stolen (pictured in header). Go to the left to the Italian Gardens. These were constructed in 1860-1 by James Pennethorne at the instigation of Prince Albert. The water supply was piped from St James's Park to the pumphouse where a steam engine (now an electric pump) operated the fountains. On the east side a stone bench marks the site of St Agnes's Well. Nearby is a statue, originally sited in Trafalgar Square, of Edward Jenner (1749-1823) who developed the smallpox vaccine. The balustrades have 5 patterns of urns which have weathered badly but one of each design has been re-carved by English Heritage. Walk along the right bank of the Long Water. This was created for Queen Caroline from a string of ponds along the course of the River Westbourne. A wildlife area borders the Long Water. To the right is a view of the granite obelisk commemorating the explorer John Hanning Speke by Philip Hardwick (1866). Continue to the statue of Peter Pan. This was commissioned by J M Barrie from Sir George Frampton in 1912. Take the path towards the Queen's Temple. This feature of 1734-5 is attributed to William Kent. To the right is a view of Physical Energy by George Frederick Watts (1907). Continue to the Serpentine Gallery. The building was originally a refreshment room of 1934 and was converted in 1970. Continue towards West Carriage Drive then go right through the South Flower Walk. Detour to the left to view the Albert Memorial and Albert Hall. The Gothic memorial was designed by Sir George Gilbert Scott and erected in 1864-72. It has been restored by English Heritage and the figure of Prince Albert has been re-gilded. Arts, Industries and 169 cultural figures are depicted along with the four continents that contributed to the Great Exhibition. Return to and continue along the Flower Walk. At the end is the Esme Percy Memorial by Silvia Gilley (1961). Go right along the Broad Walk. The original elms were replaced with limes and maples in 1954. To the right a Portland Stone cover marks the site of St Govor's Well. Go across to the left to the south front of Kensington Palace. This was converted into a palace for William III from the Jacobean Nottingham House in 1689. There is a statue of the king visable through the Crowther Gates. Go to the right and re-join the Broad Walk. To the right are the Round Pond and two wooden war memorial shelters. On the left is a marble statue of Queen Victoria sculptured by her daughter Princess Louise. On the left is a Sunken Garden first laid out in 1908-9, based on a Tudor garden at Hampton Court. At the end of this path is the entrance to the state apartments. Go through the topiary garden to the Orangery. This was built in 1704-5 to the designs of Hawksmoor and later altered by Vanbrugh. There are parish boundary markers along the path. To the left is the 'Time Flies' clock tower & drinking fountain (1909) and the Elfin Oak, scultptured by Ivor Innes [pix]. The Diana Princess of Wales Memorial Playground (opened in 2000) is only open to adults with children but can be viewed by going around it to the left then right at North Walk. To finish the walk at Queensway exit at the Black Lion Gate to the left and go right at Bayswater Road. To complete the circular route continue along North Walk then go through the North Flower Walk. Exit at the Marlborough Gate to the left and go right at Bayswater Road.